I stand corrected. Mrs. Syme, the sweet lady who handed me the keys to her beloved house today was quite emotional at the end of the closing. She came to live in this house after she met and married her husband, Alexandria obstetrician Robert Syme. I know just a little about Dr. Syme. He practiced medicine in Alexandria for 44 years and delivered over 6000 Alexandria babies before retiring in 1997. He was a big fan of Charles Goodman and modernist architecture so he bought the Sevareid House from the Sevareids in 1958. He loved to entertain so he hired Goodman to build a formal dining room — the only additions ever made to the house. He passed away in 2009. 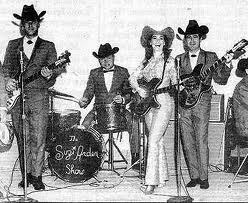 He was a widower when he met the current Mrs. Syme — Mariam “Suzi” Darden or Suzi Arden as she was known in the world of country music. Suzi met Robert while she was on a mission to the Mormon Temple in Maryland. She lived in the house since they were married in 1995. To Suzi, it is The Syme House on Syme Hill. Before she was Mrs. Syme, Suzi was a working musician — a fiddler and a guitar player with her own band and, at one time, her own Las Vegas revue. 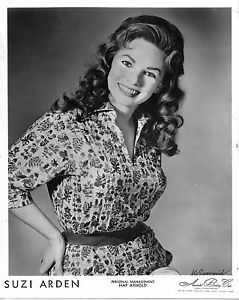 Since I’m a huge music fan, I really want to learn more about Suzi’s career and what it was like for a woman to be a working and touring musician back in the 1950s and 1960s. She still plays today — I’ve seen her white electric fiddles and music stand set up in the house library, I’ve heard she also has a 1940s era Martin guitar. I intend to talk to her more in person but since I’m interested, I applied modern technology and googled her. I found a treasure trove of images, videos and a surprising story about one of the most famous guitars ever made. 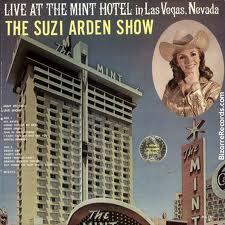 When Suzi had her Vegas review, she had many fans and admirers. She told Bill that one gentleman even gave her a gold mine! One of her friends was the owner of the Rickenbacker guitar company. He brought in a prototype of a new guitar for her to try with her band. It was the very first 12 string electric Rickenbacker. This guitar had a very distinctive jangling sound and Ric’s were very popular with country musicians at the time. The other musician slated to receive a prototype was another Rickenbacker fan. Enroute to NYC for their appearance on the Ed Sullivan Show, the second prototype was waiting for the Beatles and George Harrison. Suzi played her Ric on her most popular album “Live at the Mint” and George’s Ric can be heard as the opening guitar sequence of “Hard Days Night”. The Beatles made this guitar famous and fans include Tom Petty, Roger McGuinn, Jimmy Buffett and a slew of other jangle pop players. But Suzi had the first one. She sold the guitar in the 90s to a Japanese collector. It’s considered one of the most famous guitars ever made. This is all SO COOL!! Janet, Thank you for posting all the info about Suzi in your blog. We have been friends since 1951 and I’ve enjoyed every word about Suzi, Bob and the Syme house that you posted. You are an excellent writer. I told Suzi that you should write the book of her life that she’s always wanted to do. I also told her to talk into a tape recorder as she remembers the past and the writer can put it all in order. Thank you for using the pictures I posted on YouTube of Suzi Arden.